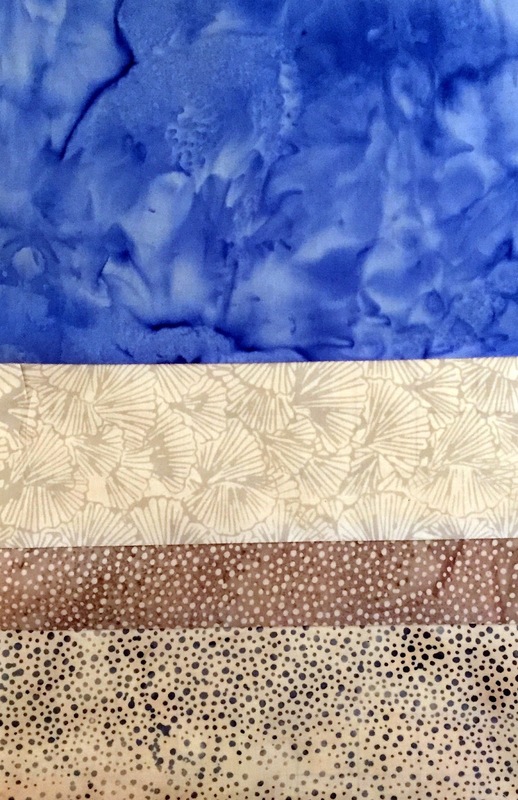 The finished size is 75 X 88 inches but it can be made any size by adding or subtracting fabric. Strips are 3½ inches wide and the offset is 1½ inches. All seams are ¼ inch. Press the Bargello rows towards the top and towards the bottom of quilt. 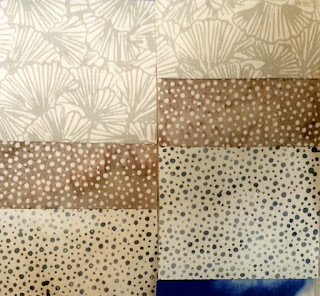 2942-360-WAIKIKI (cobalt blue batik dots) for pieced outside border. If you do not want to piece the outside border, you will need about 3 yards. Remove salvage and cut 21 (3½ by 43) inch strips from SPRING (Mountain Majesties). Make sure they are all the same length. Keep strips in order by numbering 1-21. 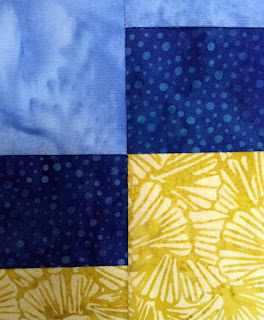 Cut 6 (3½) inch wide by WOF strips and 2 (6½) inch by WOF strips from CORNFLOWER. Set 2 aside for 1st top border. Cut 4 (3½) inch wide by WOF strips from 2942-WAIKIKI. Set 2 aside for 1st bottom border. Cut 8 (2½) inch wide by WOF strips from CHERRY and set aside for 2nd border. Cut 21 (3½) inch strips from strip sets A. Cut 21 (3½) inch strips from strip sets B. You will have a total of 21 Bargello strips A and 21 Bargello strips B. 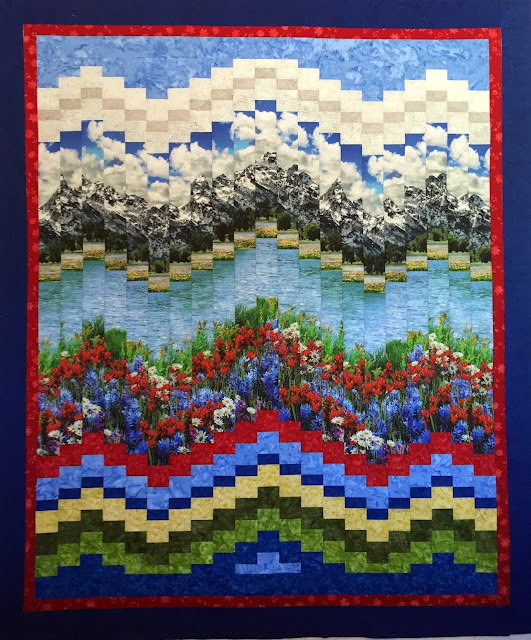 To each Mountain Majesties strip, sew one Bargello strip A to the top and one Bargello strip B to the bottom making sure that CORNFLOWER is on the outside top and outside bottom. Keep the strips in order 1 to 21. I find my design wall is the perfect place to stage the strips and keep them in order. The strips are long and it is important to sew them together evenly. 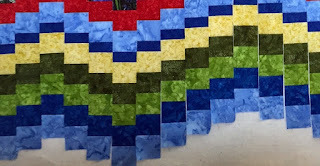 Begin by pinning the two intersecting seams by the 2-inch February block and the 2-inch Wakiki block. Pin frequently being careful not to stretch the material. Sew together in three groups of five and one group of six. There will be uneven edges at the top and bottom of every seam. They will be trimmed later. Sew the first group to the second group and the third to the fourth. Sew both halves together. Trim the extra fabric from the top and the bottom. Measure the quilt top side to side. It should measure about 60½ inches. 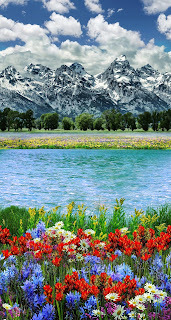 Prepare and sew 3½ border of CORNFLOWER to top and 3½ inch border of 2942-WAIKIKI to bottom. Using the same measurement from the first border, prepare and sew 2 inch border of CHERRY to top and bottom. Carefully measure quilt top from top to bottom. Prepare and sew 2½ inch border of CHERRY to each side. 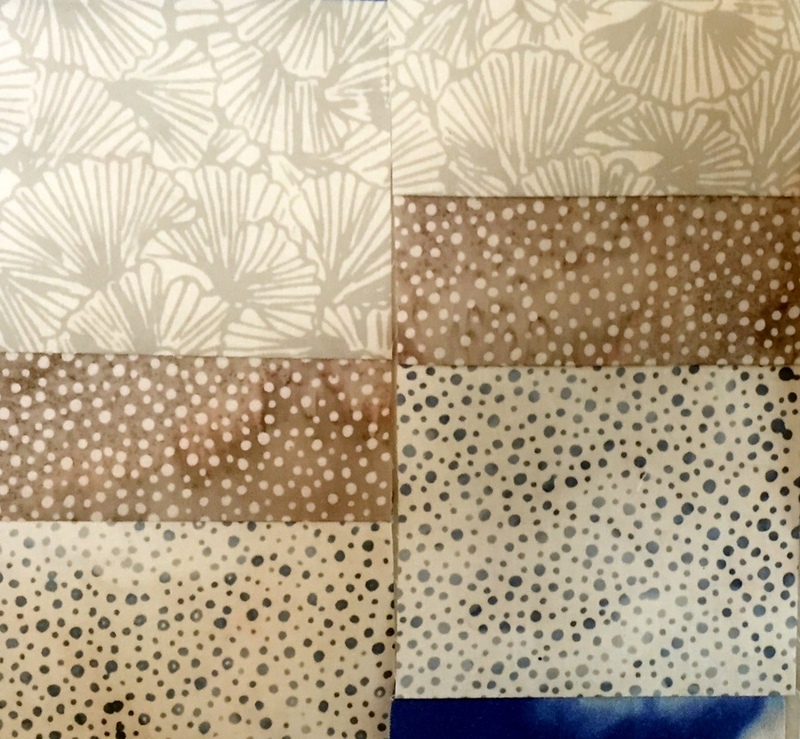 Cut 4 ½ inch wide strips from WAIKIKI. Measure quilt from side to side. 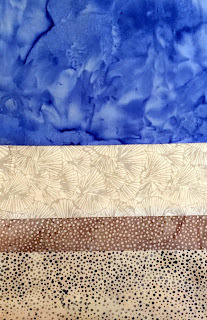 Prepare border and sew to top and bottom of quilt. Measure quilt from top to bottom. Prepare border and sew to sides. Sandwich and quilt as desired; bind and secure label. We always like to get back to Colorado Springs for the Spring migration - around mid-May. This year we've not been disappointed. A Bullock's Oriole was here to welcome us. He stayed around for a few days before moving on. We always enjoy the Western Tanagers. This year we've had 5 or 6 flying around. We've seen a couple of male Black-headed Grosbeaks and one female. This is a younger Western Tanager with just a hint of red on the head. We had an entire flock of Chipping Sparrows stop by one morning. I love the Woodpeckers! This Downy stops by everyday for a snack. We've also had quite a few Pine Siskins this year. This picture shows the streak of yellow better. This is a first for the yard. Another first - a Nuthatch. It's hard for me to determine size when I look at my pictures. I assume this is a Downy and not his bigger cousin the Hairy. The Bentsen Rio Grande Valley State Park is one of the few places in the US where you are almost guaranteed to see an Altamira Oriole. This one was busy trying (with little success) to build his nest on the wire. There were several "starts" that looked like air plants along the wire. Hopefully, this one went better. Black-bellied Whistling Ducks are another South Texas specialty although I have seen them in Florida. On Saturday we took a guided walk with a Naturalist through some wonderful habitat. Unfortunately, I can't remember the name of the place - I'll have to check with Cheryl. Our guide took us to a portion closed to other visitors so we could see the nesting Green Parrots. Too cute! Rabbits are just too photogenic! Another treat - a Long-billed Thrasher. Apparently the Long-billed and Curved-billed Thrashers look extremely similar. I'll bet I mis-identified this on our last trip in 2013. Cheryl spotted this Texas Lizard. This is a Couch's Kingbird - or is it a Tropical Kingbird? Doves! We saw lots of Doves. This is a small Inca Dove. Here the Inca Dove is next to a White-winged Dove so you can see the difference in size. The whole time we were visiting, Cheryl tried to find us a Road-runner. Laura and Cheryl have seen them in their front yard (so they said) but try as they might, they were no where to be found! Bill and I took a ride one afternoon down around the border (and met lots of nice Border Patrol) and when we got back we proudly showed then the picture of the Road-runner we found! Bill and I took a "little" detour on our way from Florida to Colorado. We drove south to Mission Texas for a fabulous visit with daughter Laura and her wife Cheryl. Cheryl shares our passion for birding and arranged several trips to area hot spots. The Great Kiskadees were everywhere, Laura & Cheryl's backyard and at Sabal Palm Sanctuary on the Rio Grande River in Brownsville, Texas. Another bird you'll only see in South Texas is the Green Jay. Absolutely gorgeous birds! This one was at Bentson Rio Grande Valley State Park in Mission. And what trip to South Texas would be complete without seeing one (or 20) Plain Chachalacas! They are big chicken-like birds that make a racket! We saw two types of hummingbirds: Buff-bellied by the dozen around the Hummingbird Bush in the backyard and this Broad-billed Hummingbird at Sabal Palm. Cheryl spotted this Harris's Hawk sitting on a light pole - a lifer for Bill and me! And then there are the parrots! Cheryl took us into town just before dusk. We parked in a shopping center lot and watched as dozens and dozens of Green Parakeets flew in from their day's activities to roost on the overhead wires. It was really something to see - and hear!! We had a fabulous visit and can't wait to go back! The girls were wonderful hosts. Thank you so much!! It's been very interesting to watch the American Goldfinches. When we arrive in Florida in September, we rarely see any. Our feeders host lots of Pine Warblers, but not many finches. They begin to trickle in starting in November and the numbers grow throughout the winter months. By February, we have so many that we are filling the sunflower feeders almost daily. Last week, we had about 200 on the feeders, the ground and in our oak tree. The next day, they were gone. This Yellow-rumped Warbler had the feeders all to himself! This year we have two Sherman Fox Squirrels that visit almost daily. There has been a lot of new construction in the area so we don't see the numbers as in previous years. I hope they are ok.
Any day that we see a Pileated Woodpecker is a good day! We had an unusual visitor this morning - a Brown-headed Cowbird. Our beautiful Bluebirds are much more welcome! In other news, this is a sink hole that opened up in a drainage ditch in front of a neighboring community. Scary!